The crown of King Roger I, the first crowned king of Sicily, passed peaceably to his son William I (1151) and grandson William II (1166). However, the death of William II in 1189 without a surviving son or brother set the stage for conflict. 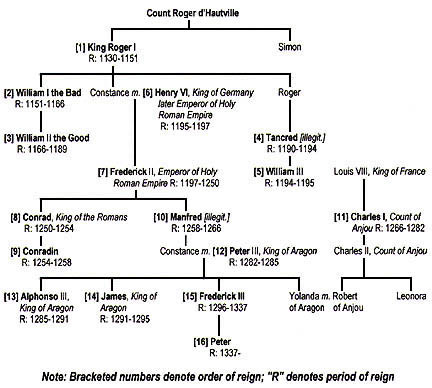 Henry VI, King of Germany and later Emperor of the Holy Roman Empire, claimed the throne in the name of his wife, Constance, who was a daughter of King Roger I and sister of William I. Tancred, an illegitimate son of King Roger I's son Roger, was a rival claimant. Because Henry VI was occupied with other problems in northern Europe and did not press his claim aggressively, Tancred prevailed. However, upon Tancred's death and the accession of his son William III, Henry VI seized the throne of Sicily by force of arms, bringing the Kingdom of Sicily within the powerful ambit of the Holy Roman Empire. Upon Henry VI's death in 1197 the throne of Sicily passed to his remarkable son Frederick II, who was to become widely regarded as one of the most brilliant rulers in the history of European monarchy.